Take the Exclusive Dog Food Double Dog Bowl Dare Challenge and see how your current dog food compares! Argyle Feed & Hardware is challenging your regular pet food with the Exclusive Double Dog Bowl Dare through July 31st or while supplies last! 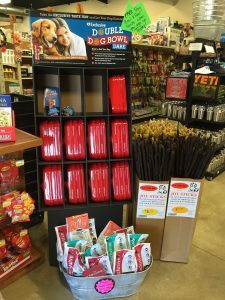 Stop into Argyle Feed today and grab your free double dog bowl along with 1 lb. of Exclusive Dog Food. Take your free double dog bowl home, fill one side with your current dog food and the other with Exclusive Dog Food. Let your dog take the Exclusive Dog Food taste test challenge! Check out our Product Pages to learn more about Exclusive Pet Food at Argyle Feed & Hardware. This entry was posted on Wednesday, June 14th, 2017 at 1:37 pm	and is filed under Dog, News & Updates. You can follow any responses to this entry through the RSS 2.0 feed. You can skip to the end and leave a response. Pinging is currently not allowed.